Fettled by Hanson Motorsports Research, this Halberd Mk1 is fitted with a mildly modified 3.2L inline-six and will be fielded in the 2200cc-3299cc class, bearing the number 326. This is a tuned production car, not an all-out race car. Aged 26 at the time of the rally, he has chosen to enter the Corso di Fruinia to see how well this modified production car can perform. Joshua’s younger brother, exactly two years younger but equally eager to enter the race. How will these two brothers fare on what could potentially be the adventure of a lifetime? Only time will tell. below (and including) 799cc- The birmingham snake van custom, a van for farmers with a tiny and effiicient engine for light work. However, this one has been stripped and given sportier engine internals. 800cc to 1399cc- the birmingham R4 concept. A lightweight Rear engined sports car with a little boxer-4. This one is a factory prototype going through testing. 1400cc to 2199cc-The Birmingham 2000 lowlight. Another road going vehicle, this time a heavier duty pickup with some light modification. 2200cc to 3299cc- The birmingham Brickham race car. A custom rally car with a powerful V8 and race upgrades all round. above (and including) 3300cc- the birmingham Nemesis. taking advantage of the unlimited displacement, this monster was custom built with a 7.7l V12 intended for light aircraft use on a high-tech race chassis. In 1952, Martin Penrose was a young engineer building custom vehicles out of his shop in Pittsburgh, Penrose Customs. Having emigrated from Britain before the war, he brought a uniquely European perspective to his creations in the US. Many of his customers were affluent European immigrants who found themselves dissatisfied with traditional American offerings. One such customer was a British man named Stirling Greene, who was a friend of his father’s before the war. He was a racecar driver and wanted Penrose to build him a pair of race cars to compete in the 1952 Corso di Fruinia. 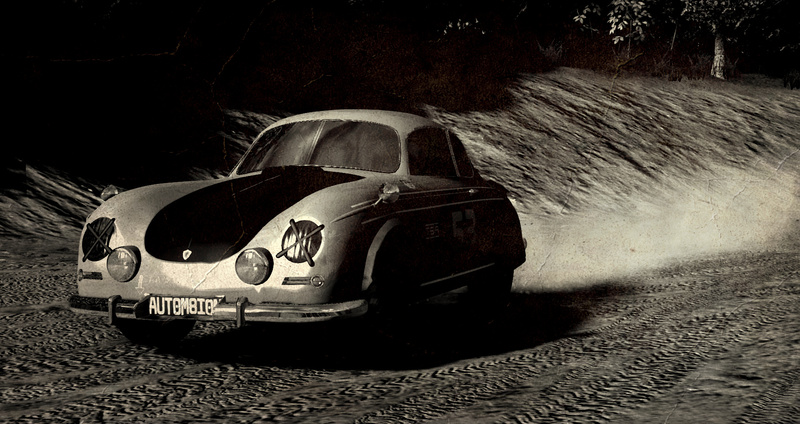 The cars would be based on a certain Swedish automobile which had already proven itself in rallying. He wanted the car to be extensively modified for maximum performance and handling prowess. The donor cars were stripped and gutted to reduce all unnecessary weight, and body panels were remade with aluminum for even more weight reduction. The first vehicle, #92, maintained the donor car’s front-drive architecture, but Penrose fitted a custom-built 800cc boxer-4 engine which produced 80hp for a remarkable 100hp/liter ratio. Greene wanted the second vehicle, #99 to house a 1400cc engine which could produce up to 110hp. However, the engine proved too big to fit in the car’s compact engine bay. Penrose and his team ended up doing a complete RWD conversion to get the engine to fit. The result was two vehicles which, although they appeared nearly identical from the outside, drove like completely different beasts. #92 was incredibly lightweight and maintained an easy to drive character with a hint of understeer. 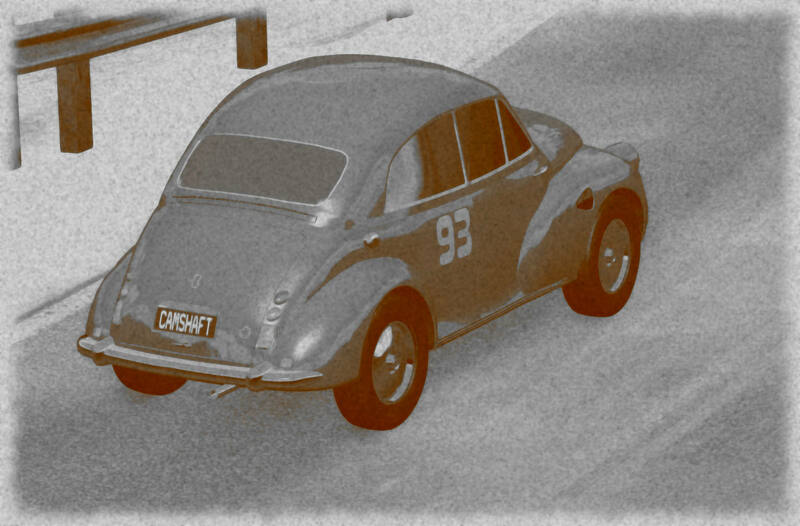 #99 was an hot rod with a remarkable power-to-weight ratio and a propensity for power sliding. 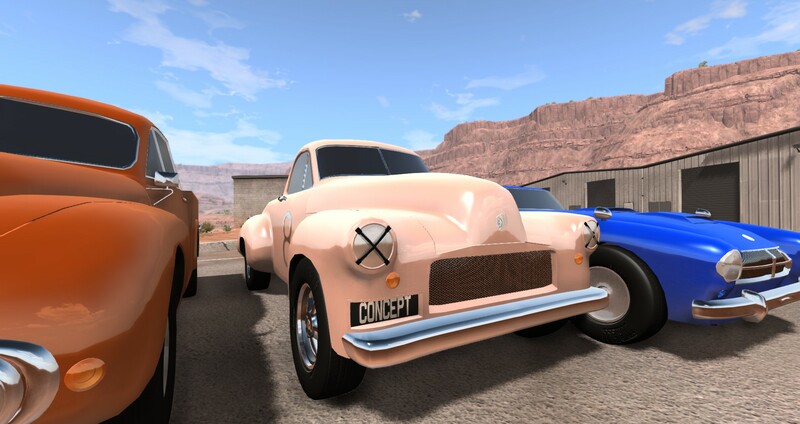 Modified for road races around Europe, the Modele 1949 La Course has had some changes made to it. These changes include the removal of the rear bench seat and some minor engine modifications. 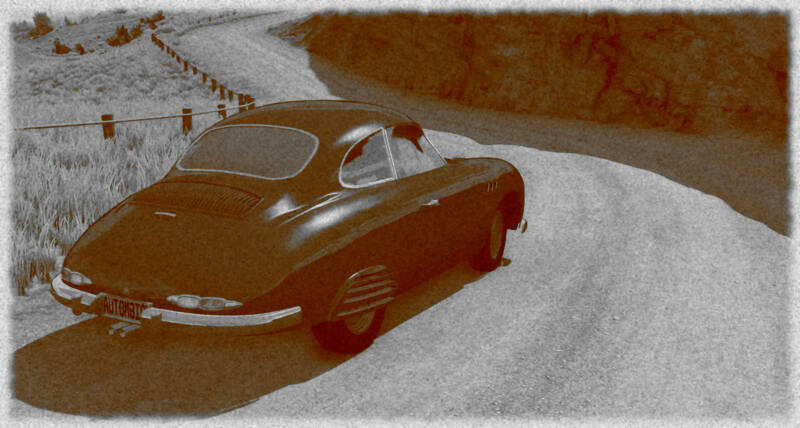 Other than that, the Modele 1949 La Course is practically stock. 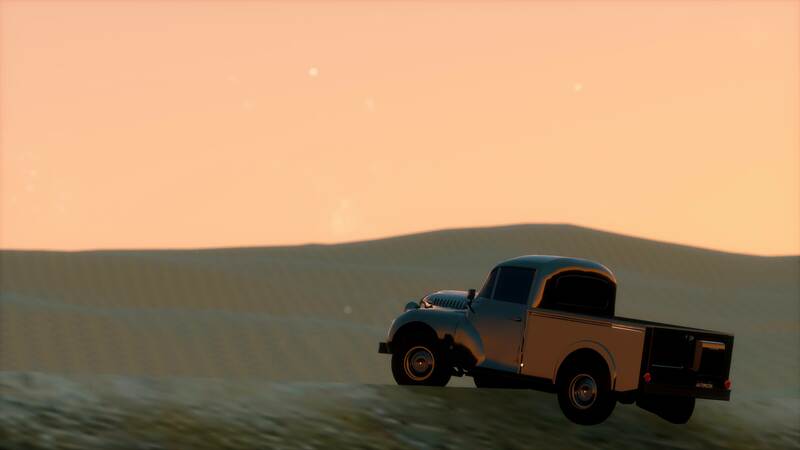 Based on the 1936 Noda Type 83 Light Truck developed for the Japanese military, the Noda Type A2 uses a mix components from the new Noda Type A1 sedan and Type 83 in the drivetrain and chassis. 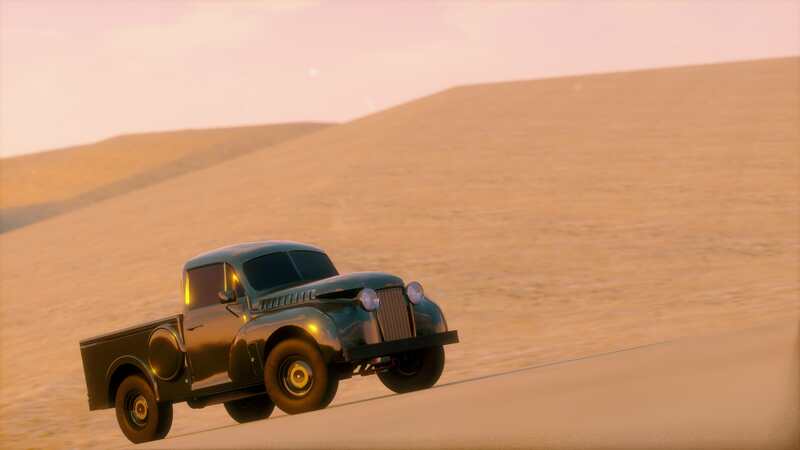 The spec being used in this race is a 1951 Noda Type A2 modified to fit the styling of 1936 Type 83 Light Truck. Full disclosure, my Boccaccino entry has 4x4. This was done for lore reasons (and to make it a bit different) and I don’t think it helps its performance much. In fact, compared to going with a straight RWD setup, it understeers too much and is slower if anything because of it! Definitely happy for it to be used with driveshaft disengaged etc if that is more realistic or fair! So, these last few days saw a disproportionately huge influx of new contestants. They’ve almost doubled in 3 days, leading to a total of 107 cars. I thank everyone who has joined with a decent design (full list is in the OP) and thanks especially for those who did so with a realistic, period-correct design. I like seeing that. I apologize profusely for all cars I have or will have crashed in the completion of this challenge. 9 cars are the dreaded (see above) 4x4. They will be driven with the front driveline disengaged when on paved roads. 6 are mid-engined rear-wheel drive. 7 are rear-engined rear-wheel drive and crashed in the first corner. 66 are front-engined rear-wheel drive. I was joking about those crashing in the first corner. average: eternity, mathmatically. Ok, alright: 12.9. Stage 1 (“outside loop” timetrail of the Automation Circuit) of the Corso goes from San Martino to Fienna in 4 sectors. The start is at the Piazza di San Martino; the main square of the principality of San Martino. This is the small mini state inside Fruinia; one of the oldest soverneign states, a republic nicknamed “il tranquillissimo” since the 16th century. It is not the most calm this week, when each day one of the 5 classes of cars depart from the central square. Once outside the old city walls, and back into Fruinia, the paved road disappears and gravel roads twist into the low Arpenino Mountains. It is past the small city of Arpeninetto that the real climb towards the peaks of the Arpenino mountain range begins. The roads are rough and unpaved and go through farm land and pastures, dotted by the occasional rural mountain village. It is through the Passo Senatore, the highest of the range, that the road then twists into the high peaks, and we enter the Fruinian province of Fruscany. Paved roads in Fruscany, but at this high altitude they are frosted and the sides covered in snow. The road surface is a challenge on this wet side of the Arpenino mountain range, at least all the way until the foothill town of Previ. Bendy roads through the foothills with the occasional village or small town open up more and more as we get close to the historical Via Fruinia. The classical highway is a large paved road, not quite a modern highway, but wide and straight. The stage ends in Fienna, a medieval city center with a modernized and industrial periphery. It is here the teams can rest and repair or maintain their vehicles. The next stage is only due in a few days, as the rest of the caravan catches up. 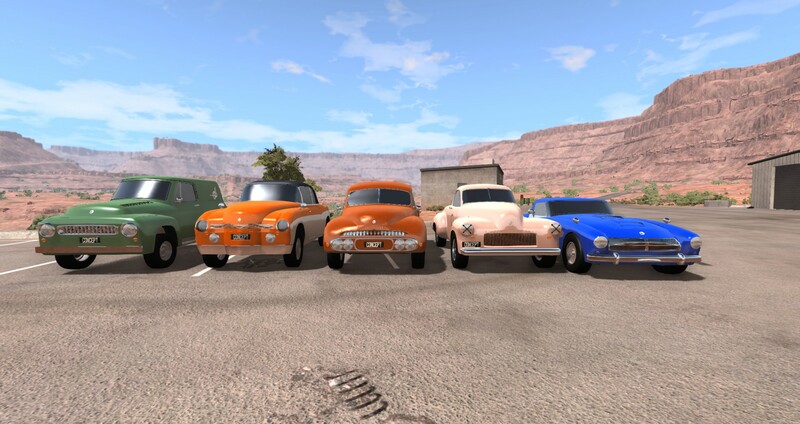 And the cars of the smallest class of the Corso are ready to start the adventure ahead. It is a quite a sight on the Pizza di San Martino, with all these small yet loud vehicles. First to leave are the organisation’s showcase car, driven by local hero Massimiliano Godini. The PMI Polloi Barudion Aero is an adaptation one of the locally (in Fruinia proper at least) produced family cars. The car has been stripped for racing and that includes the muffler. Hardly even knew a three-cylinder could be this loud. It is also amazingly the lightest car competing in the Corso. With the Suzume Kaikyu San Ebi Kei a second Suzume and a second Japanese concept car at the start of this Corso. Kei means light in Japanese, and this car is quite light, though not as light as for example the PMI Polloi. It needs to be light, because Japanese Kei-regulation prescribe a maximum displacement of 360cc for a four-stroke engine, which is what this car has in the form of an inline 3-cylinder. The Epoch Model 10C Modifica looks impressive for a small car with those big wheels. It handles itself well on the dirt roads away from San Martino. The KMC 800 Roadster is a lightweight sports car with an 800 racing boxer engine. It appears to be nippy and agile, and it needs that agility when just outside of San Martino it needs to evade a group of goats that suddenly appeared on the road. Luckily the small excursion into the grass did not lead to any damage. The Marcello Tipo 300 is clearly not here to win. With only 17 horsepower it’s the slowest and least powerful car to appear at the start here. But, if this car finishes the Corso, it’s clear that this cheap little local car is reliable and able to tackle any situation in the Fruinian cities and countryside. 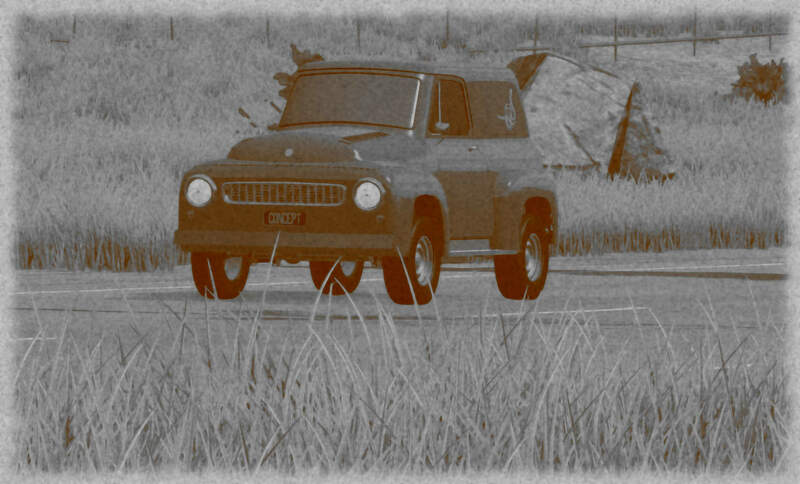 The people of San Martino, the most tranquil of states, have been enjoying the influx of beautiful automobiles into their small principality, but there is one that brings less enjoyment. The CMW S946 Bergmann Special, beautiful to look at, but the cause of many a complaint to the Council for the horrible noise it makes. The source of that noise, an intricate miniature boxer-6, that looks like a Swiss watch, but it remains to be seen if it has the reliability of one. 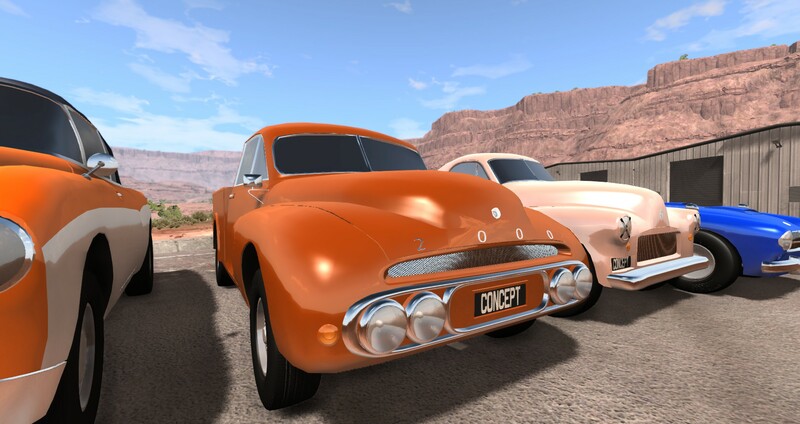 The Juggernaut Automotive fanclub is out in full force as the Juggernaut Automotive Runabout is the first of six of its brand to compete. The small 750cc engine seems capable in this category, with the advanced front wheel drive system trying to pull the car to a competitive time. The Brazilian Barato Motors 800 Sport Race with #54 is a one-off adaptation of their low volume road car. The inline-6 engine is tuned to formula racing car spec, and the engine is just as expensive and reliable as well. In fact, based on the issues the car had to just get to this starting line, it is one of the most unreliable cars in the field – as well as one of the most expensive. A modified Condo Sprint is meant as a cheap car for the masses - and a competitor of the PMI Polloi and the Marcello Tipo. Like the PMI and unlike the Marcello, this is not your mildly adapted standard factory spec car. A good performance will nonetheless boost sales. One thing we immediately notice is the Northern Irish driver, Hill, struggling with the wheel over any bump or pothole. The relatively high power to the probably still standard front wheel drive system is clearly interfering with the steering. The latest iteration of the Znopresk Z849 is made to drive on unpaved and bad quality roads. The car competing here is a competition version of the budget vehicle. The Aeros Shrew is small as its name suggests. 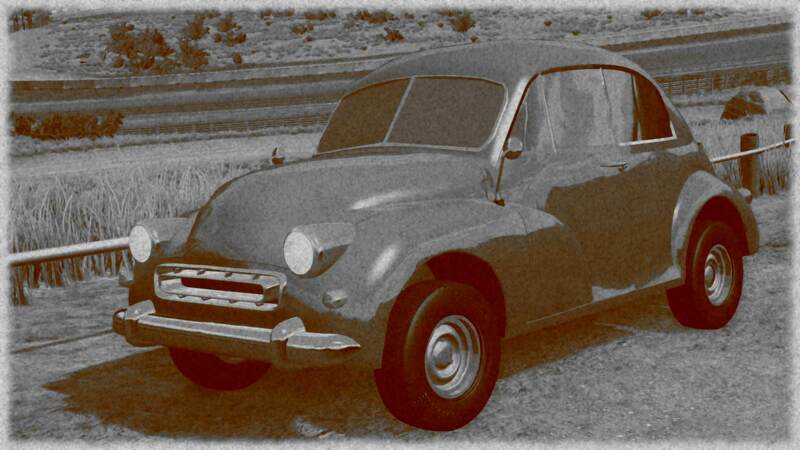 The car is apparently a prototype of a cheap, front-wheel drive, family car, and it is here for testing. But I fear some more work is needed on this #46 car, as it looks harsh and uncomfortable to drive. Even at low speeds the driver is toiling away at the steering wheel. Two local boys, Martino and Rizzo, in a modified Giusseppe G220 with an adapted motorcycle engine. Despite the light engine, the car is the heaviest in this class. The drivers have no experience in events like this. The start could be better; I’m not sure in how far the car was tested, because it cannot start on its own power and needs to be pushed to a start by by-standers to prevent the engine from stalling. The LSV Mark RS is LSV’s performance addition of the popular LSV Mark budget family car with folding roof. It is a light and quirky car, but there are doubts on the reliability of the front-wheel drive system. The RatonAereo 654 is a prototype, and with prototypes come technical issues. It is therefore no wonder that the little bubble sports car stands still for repairs to the engine quite fast out of San Martino. A home game as well for the Scuderia Cisalpina and their lightest sports car on the market, which is the heaviest car starting here in this class: the Cisalpina Superleggera 750. The beautifully styled little car has a very high-revving engine as we can hear. This might be part of the reason why it struggles putting down power on the gravel roads of the foothills. Easily among the ugliest cars at the start of this Corso in aesthetically-sensitive Fruinia, the Eagle 102 looks like a mismatch of parts. 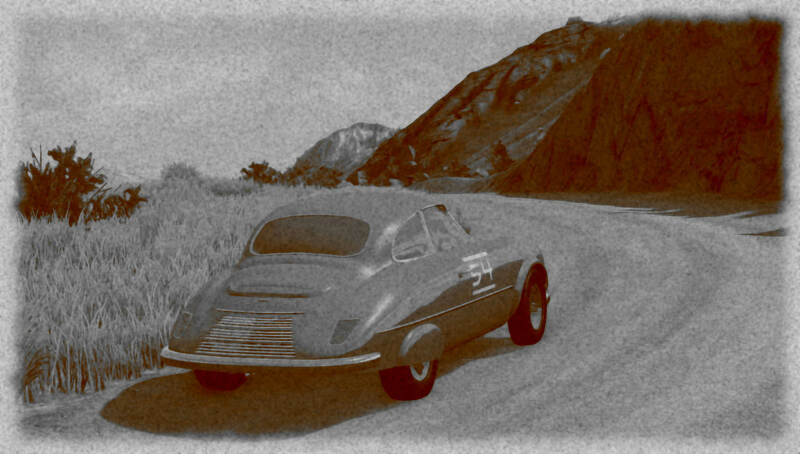 The Merciel Modele 1949 Modele 49 Course is, amazingly, a car from 1949. The #69 car is a stripped budget car with a 0,6 litre three-cylinder engine, producing a measly 25 horsepower. A van for the countryside farmer, and made lighter and faster for this Corso, the Birmingham Snake Van Custom might not be in its home country, but in terms of roads, it’s on home turf. The #92 Penrose Customs 800 is an incredibly high-strung adaptation of a city car. The engine sounds mighty for the low displacement. Powerful but not without issues, as the vibrations of the car seems to hamper its drivability, even more so when one of the wheel bolts gives up and shakes out of the axle. Luckily this does not lead to an accident, and the wheel can be reattached. 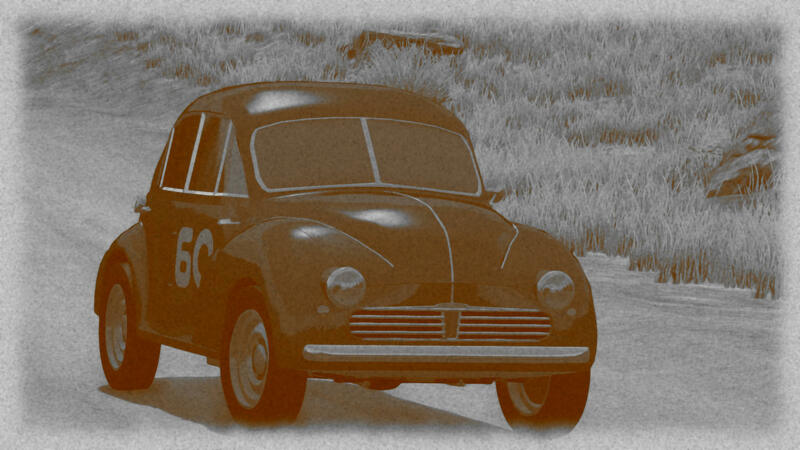 Last one to start today: the number 60 Ceder Abeille 760, an anonymous-looking family budget car. Once out of San Martino it is livelier than you would have expected. This leads a few times to an excursion into the rocks and bushes next to the road, and once to a flat tire that needs to be replaced. A bit of the scare for local boy Godini as he gets the light PMI Polloi Barudion sliding. Luckily he regains control after only a slight kiss, a smooch, a pecker with the barrier. Remarkably, a spin as well from the small-engined Suzume Kaikyu San Ebi Kei as some sudden elevation changes cause the rear heavy micro car to lose control. The vehicle ends up in the bushes, and with its nose uphill, it takes some time before it can pry itself loose from the shrubbery. It is a prelude of the torture ahead, as the little engine struggles to pull the car up the Arpenino hights. It is almost comical to see the driver of the Epoch Model 10C Modifica as it lumbers on the twisty gravel paths over the Arpeninos. He is constantly and nervously moving his body forward in the car as if that might increase the power or the speed of the car. The little 500cc engine makes enough to get it up the hill at a steady pace, but it isn’t particularly fast. Slowly but surely the Marcello Tipo 300 is climbing the hill. Too slow to get into trouble, and that might make it faster than some at the end. Something special about the CMW S946 Bergmann Special is the engine placement. Not in the rear as you might expect, but before the rear axle. This is why the whole rear of the body can be removed, to reach the small engine just behind the back seats. The advantage of this layout is a lower centre of mass and better balance of the car. 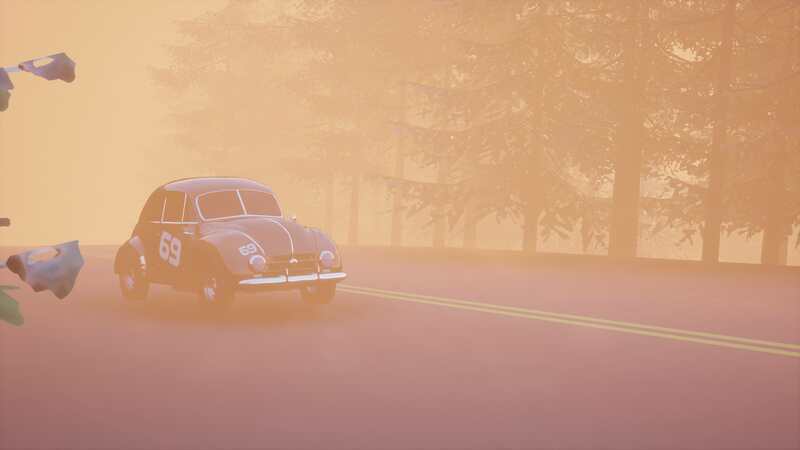 So far this shows on the dusty mountain roads. The driver of the Juggernaut Runabout is enjoying a fantastic workout it seems, the steering appears to be very heavy. While the car sets great times for an engine this small, they lose time with the driver have to stop, rest and stretch at every checkpoint. That screeching racing car noise sliding past was the #54 Barato Motors 800 Sport Race whose expensive low profile racing tires are not having a great time on loose gravel. The #93 Condo Sprint is standing on the side of the road. Hill is simply resting his arms, while the co-driver Collins is waiting it out. It’s clear the steering issues on these roads are worse than expected. The Znopresk Z849 is pretty fast for its engine size on the climb over the Arpeninos. However, it sometimes appears neither the chassis nor the drive system has been designed to go quite this quick. 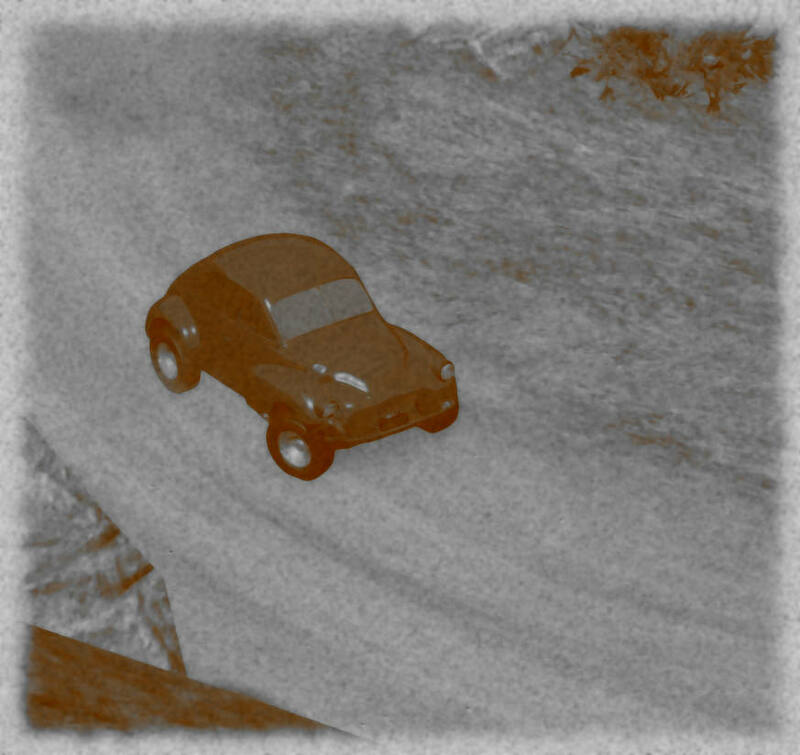 The little car is at times shaking wildly, almost to the point of appearing to be uncontrollable. 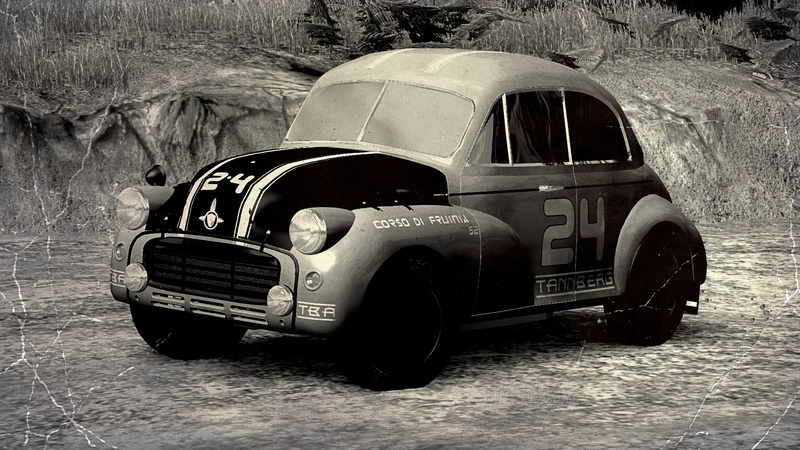 An unpleasant run on to the high peaks of the Arpeninos for the Aeros Shrew and the driver needs to take a break after hours of being thrown around by the steering wheel and the suspension. The modified Giusseppe G220 of Martino and Rizzo is excruciatingly slow on the steeper climbs. The heavily upholstered interior for 5 people that wasn’t removed before putting in an engine 3 times smaller, might play a role here. It is loud, the ride looks harsh, but it looks fast for this class. The LSV Mark RS is clambering up the Arpeninos with ease. The front-wheel drive system, the unreliability of which plagues the standard trim so much, is holding up well. The RatonAereo 654’s thin wall three pot is high revving, with power only really available high up, yet it only has just below 50 horsepower to offer even then and this is noticeable on the climbs and uphills. While the driver of the Cisalpina Superleggera 750 seems to have cracked the code on how to take on the loose gravel with the mid-engined car, bad luck has not left the team, as issues with the rear suspension necessitate a service stop. The Eagle 102 drives very much like it looks. It shakes and rattles, looks dangerous and uncomfortable. Despite the big wheels and truck like chassis on which the body rests, it doesn’t particularly care for gravel and hates bumps. 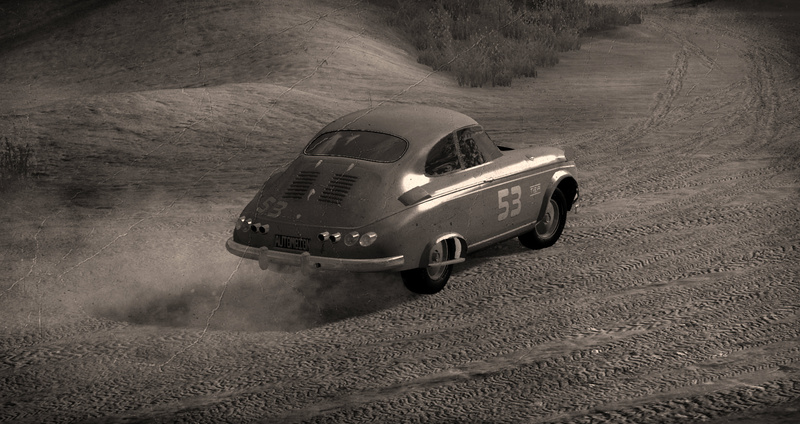 One of those bumps sends the car suddenly to the right into the guard rail, and there the big tire does find grip, sending the car up and over. Although it lands back on its wheels, the steering is damaged. This will be a long rest of trip. 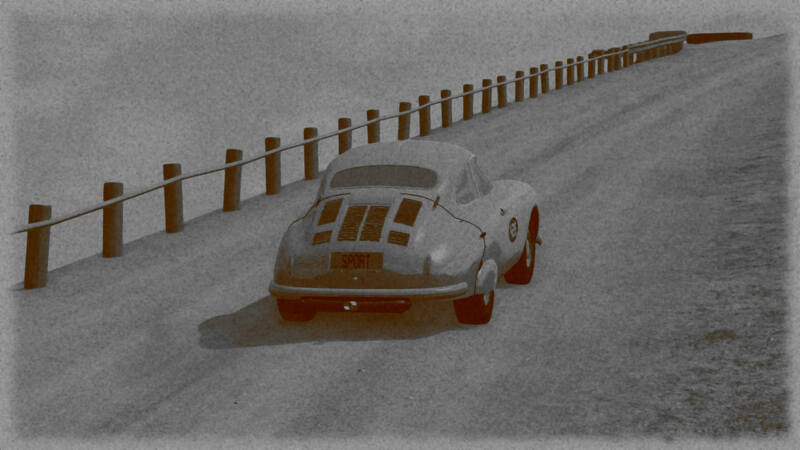 The 1949 Merciel Modele 1949 Modele 49 Course, from 1949, has issues climbing on the mountain roads. Overstressing the engine results in the car overheating, and the #69 car needs to stop a few times. Unexpected issues for the Birmingham Snake Van Custom, which, appropriately for the name, has a snake emblem on its side. This does not pass well with the inhabitants of Minervetta, a small village on the planned route, where historically snake images are taboo. The major and a delegation of citizens is blocking the road for the Birmingham. Even after some discussion with the driver, they are forced to seek a longer route around the village over small farmer paths. Not an issue for the car, but the better half of an hour time extra. 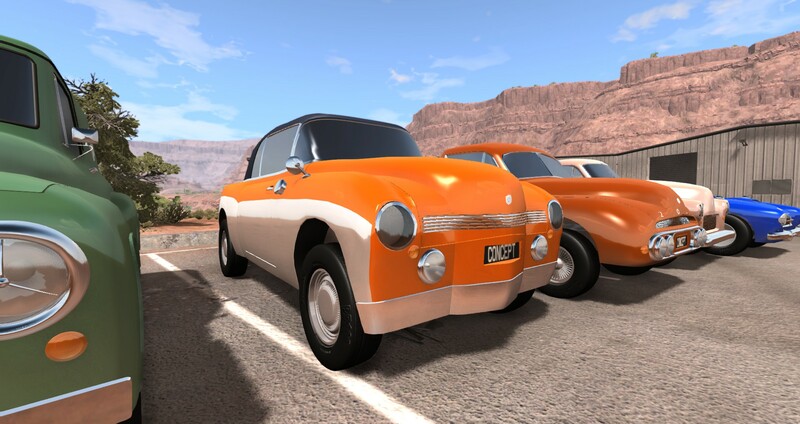 The high power of the #92 Penrose Customs 800 may send the little car uphill quickly, but it also seems to block the front-wheel drive system from steering properly, so every corner under acceleration is turning out to be something of a lottery. Lack of power is hurting the Ceder Abeille 760 on the steepest parts, but overall a clean run here. That is exactly what it is - a cheap shell hastily built around a fine-tuned racing engine, using non-fitting parts from various vehicles. We’re expecting much better results from 112E and 202 - both cars should be much easier to drive than 102, with 202 being faster and 112E cheaper and more reliable. Tuning in for 800-2199cc results! The Suzume Kaikyu San Ebi Kei has recovered well from its bush-visiting incident and calmly traverses the icy heights of the Arpenino. The descent towards Fruscany happens without anything of note, except maybe the observation that Japanese brakes are good brakes. 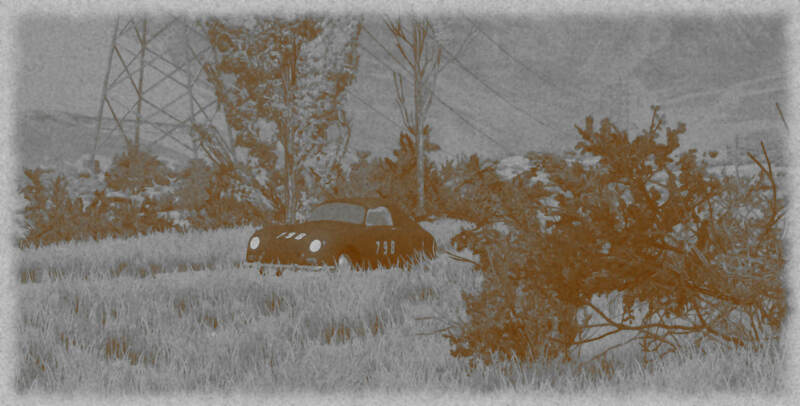 Frustration on the face of the driver of the Epoch Model 10C Modifica as the car has broken down above the tree line in the Arpeninos. 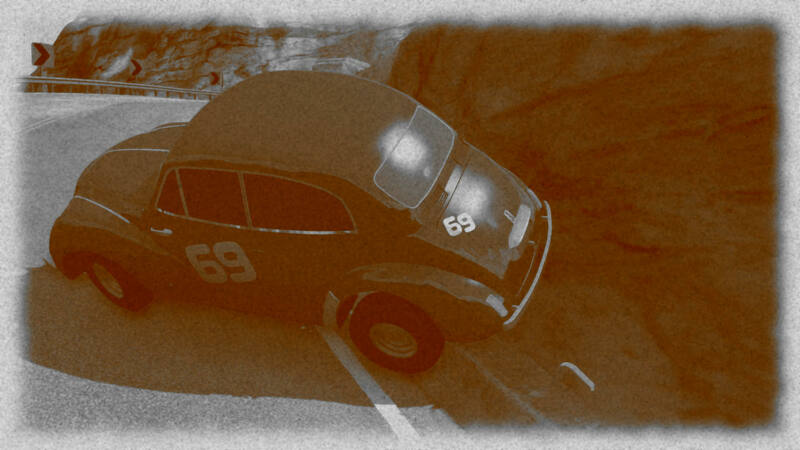 Clearly the car was pushed too hard on the climb, and something snapped in the little engine. They will be able to continue though, eventually. The KMC 800 Roadster is not well suited on the icy roads high in the Arpinino Mountains. With a spin and bump in the guard rails precious time is lost. Luckily the #63 appears to escape any damage yet again. 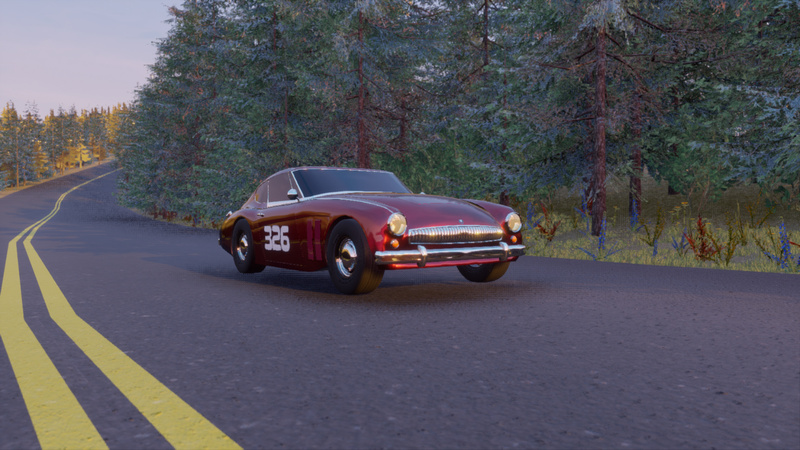 And some issues for the Marcello Tipo 300 as well as its small brakes seem to have issues with the descent on slippery roads. It’s actually quite a sight to see this little underpowered car slipping all over the place. Mayhem ensues when the CMW S946 Bergmann Special shifts down and the revs climb high next to a field of horses. The poor animals are startled by the hitherto unknown to the animals cacophony this engine makes and they panic and flee on the road. This is turn sets of a panic reaction among the owner, looking at the Corso a bit further, and the people from his village. They are all over the road and to not get lynched or hit anyone or anyhorse, the CMW stands on the side, engine off, until things have calmed down and the horses are back on their field. Slowly, then, the CMW can continue forward. A bit of nervousness on the driver’s face as well, as ideally the driver would have asked the locals for some extra petrol. The CMW seems to be burning through it at an alarming rate. We’ve already talked about the tires of the #54 Barato Motors 800 Sport Race. Their grip does not improve high up in the mountains, and indeed, driver and mechanic need to stop to fit some kind improvised snow chains to even stand a chance of staying in control of the car. Technical issues for the #93 Condo Sprint as the (for a car this small) advanced 4-speed gearbox seems to skip third gear. Despite hitting the barrier in a moment of understeer, there seems to be no car more at home on icy roads than the Znopresk Z849. The little car whizzes by at irresponsible speeds. Understeer of the #46 car almost gets into the trouble on the icy roads, but the Aeros Shrew with its exceedingly exhausted looking driver at the wheel soldiers on. Not sure if it’s that grippy or simply that slow, but Martino and Rizzi seem to not even have to slow down their modified Giusseppe G220 on the ice patches, the car takes them full throttle without losing composure. Looking remarkably composed on these road conditions, the LSV Mark RS might be sooner than expected on the Via Fruinia. What seems to be especially helping are the over-engineered brakes, almost completely stopping and turning the little car on a dime. As you would expect from a car designer located in heavy-wintered Wisconsin in the United States, the RatonAereo 654 can take the icy roads relatively well. Our reporters have noticed mild signs of understeer and instability though, causing the driver to struggle at times, but no dangerous imminent losses of control. Ice and broken steering are a bad combination, and the Eagle 102 cannot stay in control. A crash against a rock on the side of the road tears off the front left and completely destroys the front axle. There no hope left for the car, it will not make it to Fienna. This is the first retirement of the Corso. Luckily the driver and codriver are unharmed apart from some scratches and muscle pains. Downhill roads, a troubled climb and wish to make up time, and the #69 car proves to be more lively than the driver expected. The Merciel Modele 1949 Modele 49 Course goes for a roll after hitting the gutter next to the road, having spun out on the bad surface with those small tires. Luckily for the team, it can continue after only minor repairs. Again a stop for the #92 Penrose Customs 800 as parts just keep on vibrating off the car. Luckily again, everything can be collected and reinstalled. Well controlled driving by the driver of the #60 car is necessary, as the Ceder Abeille 760 is a lively thing, but the icy roads surface of the Arpeninos is not posing an insurmountable obstacle. Cheers for the PMI Polloi and local driver Godini on the last stretch before the Via Fruinia, the little car is turning out to be quite tail-happy and controllable at the same time. 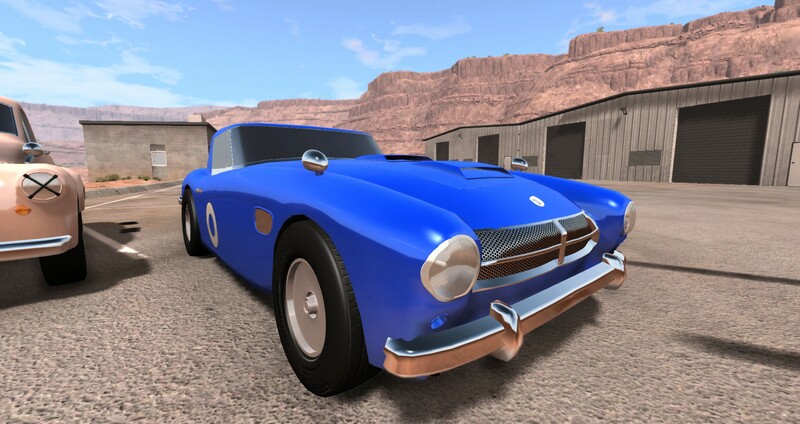 Smiles on the face of the drivers of the Epoch Model 10C Modifica now finally. 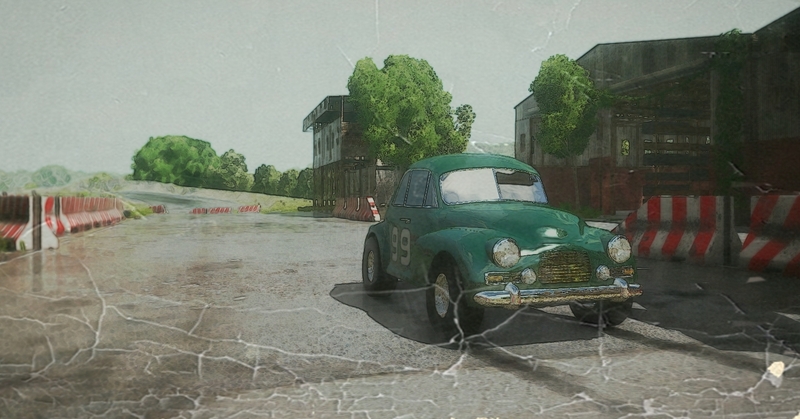 The number 89 car is light and nimble and appears to be a joy to drive down the paved roads of Fruscany towards the Via Fruinia. 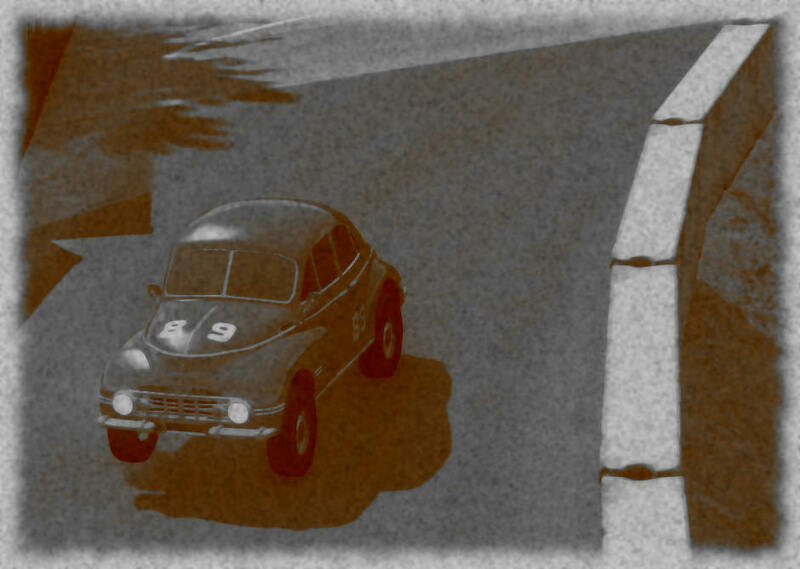 On the Via Fruinia speeds in excess of 110km/h are reached by the little 500cc car, quite a feat. The KMC 800 Roadster simply has oversteer issues, also in the wider roads winding down towards the Via Fruinia. It is near the Monastry of the Saint Lucia that the KMC goes into yet another spin, blowing up a tire, hitting the guard rail and then being catapulted towards the only part of the cliff side where there is no guard rail. It is only at the very latest moment that the KMC driver can stop the car. Fast time from the Juggernaut Runabout even though an extra stop was required to rest the driver on the sides of the magestic Via Fruinia. The engine of the Brazilian #54 Barato Motors 800 Sport Race has held up better than expected, but in this last part of the stage the car suffers some reliability issues nonetheless when suddenly steering becomes very loose in the twisty roads down into Fruscany. The driver really needs to limit speed now not be caught out by the sudden increase of steering play. 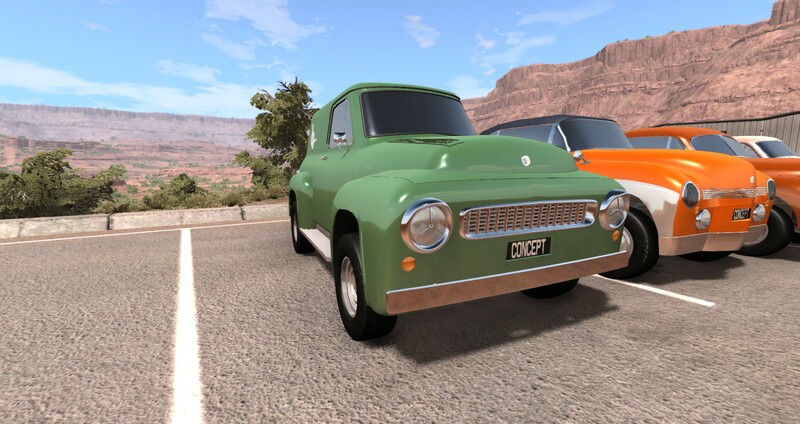 The car most unlikely to hit the guard rail in a fast corner – well maybe not the most, but it’s up there – has hit the guard rail in a fast corner. Even on paved roads the Condo Sprint is suffering from the stresses on the front-wheel system and when suddenly the front wheels start jumping up and down in a fast corner towards the Via Fruinia the car loses turning grip. Luckily the car only graces the guard rail – it wasn’t going that fast – and the #93 can continue upon the Via Fruinia towards the finish. 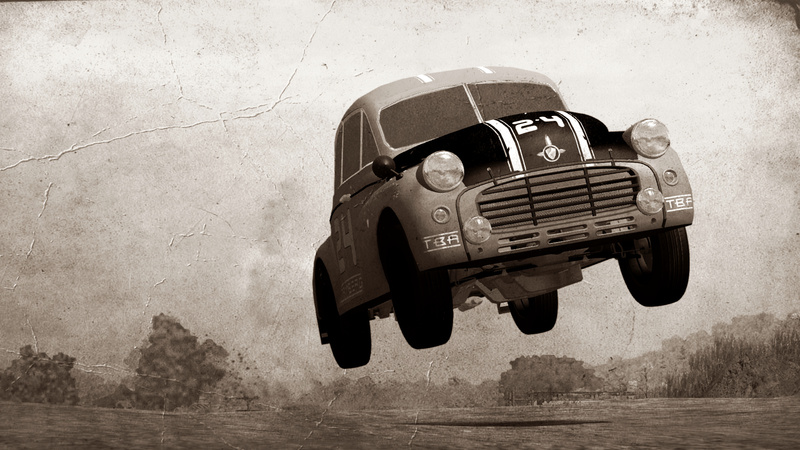 Understeer, harsh suspension, dodgy brakes and a steering wheel that gets forced out of your hands via the abysmal drive-system leads to rather hard coming together of guardrail and Aeros Shrew. While the damage is luckily limited and the car can continue, the arrival in Fienna is not a happy affair. The driver is absolutely livid, and kicks the car’s door before storming off, co-driver in tow. If there’s anything that can be said negatively about the LSV Mark RS it’s the lack of speed on the Via Fruinia. It accelerates quickly to about a 100, but that is the ceiling of that engine. 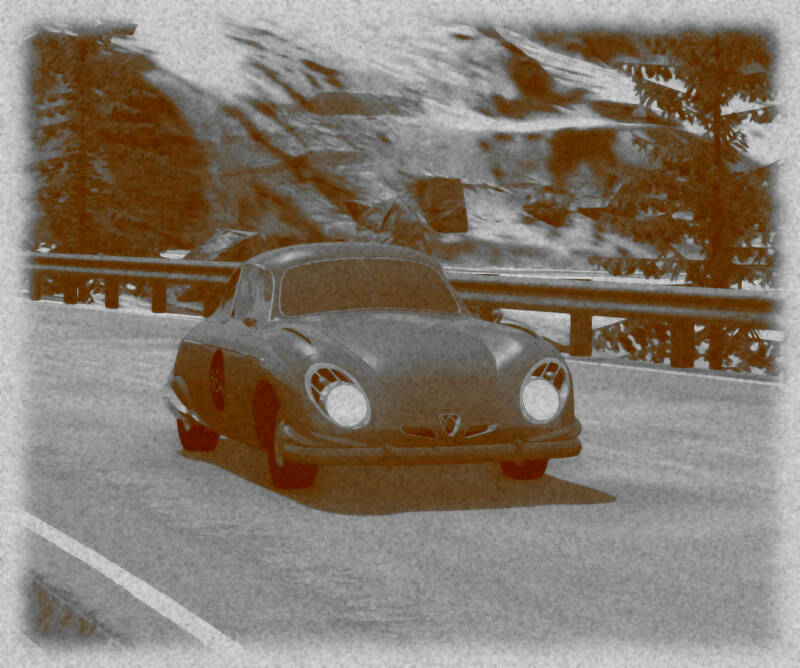 Managing well over the hills, with the driver clearly enjoying the twisty roads, even with the occasional ice patch higher up, the Cisalpina Superleggera 750 is catching up lost time, when suddenly, just before turning on the Via Fruinia, the car starts leaving behind an oil trail. It seems a new stop for repairs is in order. No real issues for the Merciel Modele 1949 Modele 49 Course on the lower hills and the descent towards the Via Fruinia. It’s not very fast though, and I think the team is happy just to end within the allowed time and without any real damage after that incident earlier. It’s not fast in a straight line, the Birmingham Snake Van Custom but it might be enough to set a decent enough time. The handling overall was a highpoint, being both nimble as well as planted and sturdy. Probably one of the fastest car in this class in a straight line, the #92 Penrose Customs 800 and its suspension tuning and the power to the front wheels, all make it extremely hard to corner quickly and smoothly. 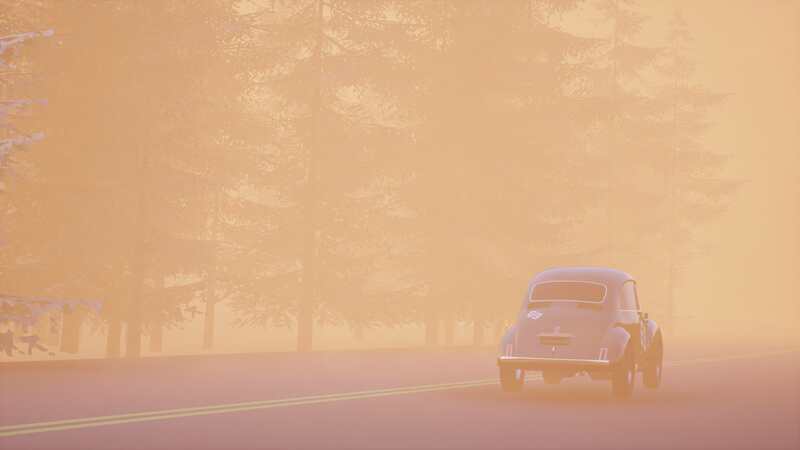 In a exceptionally bendy part of the sweeping roads down into heartland Fruscany, the car even goes round, the shaking and unwilling suspension unbalancing it that much. And a small crash on narrow roads for the Ceder Abeille 760. Nothing too critical but the team has to conduct from repairs before the descent towards the Via Fruinia can continue. For those interested, we’ve also calculated the average amount of fuel used by each (finished) car in l/100km. Very interesting reports, now I’m looking to see my “Romulus” in 800~ 2199 cc. Meanwhile in at Juggernaut automotive offices. -I’m sorry sir, The codrivers are our best mechanics but the drivers are mostly scoured from who ever wanted to participate, and proved at least some skill behind a wheel, but we didnt really have time to make sure about long endurance driving on such narrow and twisty roads. The big man who the owner of the company lights a cigar, and pours himself a small glass of whiskey. If you were driving on wheel, was my cars steering notably heavier than other cars? Also if yes, was it really that heavy? Also I didnt notice anything from my car on Sector 3 (Passo sentore) Was it just literally “nothing happened” did my drivers find a shortcut, or did you have “oopsie” moment when writing this? Indeed. As in, where the force feedback on some cars provides a slight resistance in corners, the force feedback here enthusiastically tried to pry the wheel from my hands everytime I applied the throttle. I believe wheel size and width and possible scraping of the wheels on the arches might have to do something to do with that. Your car was not the only one suffering from it, but it was strong enough in comparison to be memorable. Yes, if a car is not mentioned, it just passed that sector neither fast, nor slow; nothing of note happened. I might occasionally still mention a car like that, but not every single one. I read this, and was like, I’m sure there were only 2 seats in there. Then I checked the file; Nope! 5. How did that happen? I must’ve tried changing the body, and changed it back. Sorry. Yeah. when finalizing the design I had to choose between acceleration and top speed. I chose acceleration, because the difference was like 30+ seconds to 100 km/h, rather than the 23,9 I submitted.